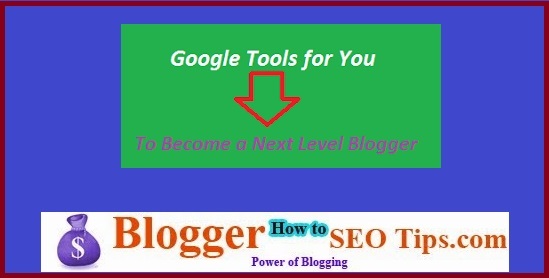 Blogging is the most powerful way to make money online but the truth about blogging business is, it needs effective dedication and hard work and of course resources are most important to become a next level blogger, that's why in this article I am going to share with you, tools provided by search engine giant "Google" for you to become a next level blogger, in my previous article I have written about these tools like Google trends and Google key word research tool but stills some tools are remaining yet but in this article I will tell you about all these tools. When I have started blogging in that time I did not know about these free ultimate resources provided by Google, if I knew then may be today I would be some where else, that's I am sharing with you about these resources. Among of these tools this is one of the amazing tool for you for knowing the exact stats about your blog, if you are blogging on blogger.com then may be you see your stats right, the stat is providing good information to you but not good enough in blogging, because you need to you Google Analytics because Google analytics tells you like how much time people are spending on your blog, real time engagement, bounce rate etc, these are really effect on your blog post ranking on search engines. I will highly recommend you to use this tool for your blog and then analyse about your blog which will really help you to become a next level blogger, this is my guarantee to you! I can not stop myself to write about this tool, this tool will show you live cine of your blog, I mean how many people are right now on your blog, what they are reading? Intelligent events- aha I am loving it, because it tells me all intelligence report for my blog. Real Time- Although there are many options you also have under this tab but I like this because I always like to see how many people are reading this blog on real time. Audience- again under this, you will get ton of options but there are few those are my favourite like Geographic location of my blog readers, users flow, this is the best one, must see this you will love this option. Other than these there are many other options those really cool, but I have discussed with you only those are mine favourite and I usually used these things for my blog. This is also a amazing tool for you, may be you read the headline carefully it's a tool for webmasters to make a blog or website more friendly with search engine results to get more traffic to blog or website, this tool is having also some amazing feature like, the tool will notify you if they will found some critical issues for your blog or website, site error, site health, server connectivity, CTR(Click Through Rate) of your blog or website on search engines etc. May be you are getting it's benefit, I hope so this tool will help you a lot to become a next level blogger, means where you wanted to be through blogging may be on the top of the sky. Search Appearance- In this tab you will get other features tabs to know more inside for your blog appearance in search engine result pages. Search Traffic- This is my faourite, I always love to track which blog posts driving me more search engine traffic which will help me to get more traffic in my next blog post. Google Index- its all about indexing your page on Google and that's really awesome. Crawl- In this tab you have many options like testing URL parameters, Sitemaps and others things you can find out under this option. This is also a great tool for blogger to optimize your blog for search engine, but now it's been replace by Google analytics but still this feature is working, so utilize this feature for your blog before the tool will completely shut down by Google. Let me tell you an interesting story, it was about July 2011, Facebook introduced a faster way to message for Facebook users, I have written an article regarding this and suddenly I have seen my visitors growth from 1000 to 4000 in a day, yes a day, which inspired me a lot and also I come to know about the power of internet to make money and also use of Google Trends. Means Google trends tell you to know what people are searching most on the web or in short what's hot on the web, even you can come to from where(the place or country too). I must say; when first I came to know about this tool from that time I become a great fan of this tool and that's really amazing for me and others too, because those wanted to see the power of blogging they can utilise this tool. To become a popular blogger creative thinking is really important like what people are searching on the web, for these first you have to know how search engine work right, actually people search on web right that's why we blogger write to provide good information that's why visitors will come to our blog and from that we can make money from blog too. This is the tool my dear blogger, which allow you to know what people are searching on the search engines. Now imagine your are giving title of your blog post exactly what people are searching on the web then what will happen you will get ton of organic traffic to your blog for free, then use this tool but remember always provide quality content to your blog to make a blog next level. Because after all content is king in blogging! This is the Tool which every bloggers must use and every blogger must use even before starting a blog, in my upcoming course which will be paid because I am putting whole my experience to create that course to help all bloggers those think about blogging as a difficult task to earn money, but I say this is really easy, if you will choose the right path and you will follow steps those steps will told you by someone who is having lot of experience, like I have more than five years experience and I have seen the market there are few new bloggers come and show that they are going to become popular but later they just quit. Can you guess the major reason behind their failure because they don't enjoy while writing, they only see at the number of blog posts they have published. But, my dear you don't make all these mistakes, if you already make then try to avoid all these mistakes and do one thing start all these things from beginning I am putting lot of time to write super amazing articles and that's it. You are done, you can become something in next because your success will motivate you to get another success. You can come to search traffic from country even city wise too, that would be easier for anyone to target the market easily. This is not a tool but not less than even a tool because this blog is a official blog of Google for webmaster to know recent information about SEO(Search Engine Optimization), I will strongly recommend you to keep in touch with this blog to stay updated about SEO and little bit beyond of this topic, but of course related to SEO. Frankly saying there are lot of things you can do with this blog and this blog is really necessary for you, there are simple things just read this blog and stay happy with all new information those all web masters will know. Remember these tools are provided for free only because to give right information to the internet users don't misuse these tools, if you will do it then definitely you will be in serious problem, if you will use these tools in the right way then no one can stop you to become a next level blogger. Keep Blogging! Happy Blogging!! and Make Money from Blogging!! Thank you for these tips Ujjwal. You are welcome and after using these tools for your blog let me know about result.